Make Music Philly is here Today, June 21st from 8am - 8pm! The concept is "All Day. All Over. All Free." 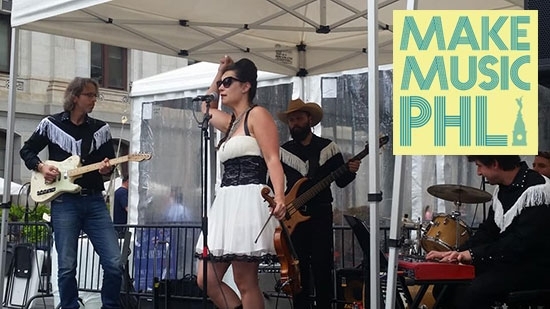 The city-wide, free, do-it-yourself music festival features professional and amateur musicians performing at traditional venues, non-traditional spaces, and in both organized and informal events all throughout the city. Everyone is encouraged to participate and come out to an event. The music spans all genres including Blues, Bluegrass, Folk, Indie-Rock, Jazz, Hip Hop and more. Make Music Philly joins a global celebration of music held each year on the summer solstice as part of World Music Day. The concept began in 1982 with Fetes de la Musique in France. It first came to the United States in 2006 as National Music Day. Now more than 500 cities in 110 countries are involved. The day of music runs from 8 am to 8 pm and all events are free. Make Music Philly started in Philadelphia in 2013.